I've had the opportunity to work with your program for the past 3 years, and with Photoshop for the past 15 years. Painting as a professional illustrator, I've seen that your program, Painter, has an advantage over every other painting program: The ability to blend colors subtly through the use of pen pressure. No other program can replicate the same effect. This means, illustrations can be created VERY quickly, and EASILY through the "Grainy hard cover" brushes. Such as the oil pastels. It would be a flawless painting tool, if it weren't for one, major problem: lack of anti-aliasing in the brush engine. Painter stands for the idea of creating tools that resemble traditional media. Aliased edges (pixelated, jagged, edges) make the program fall short of this goal. I'm writing this because I see Painter has unbelievable potential with its ability to blend color. It really matters to me, for anti-aliasing to be added to the program, and I'm sure it matters other professional artists who use this program. Programs like Photoshop have anti-aliasing, but cannot blend color. Painter can blend color, but no anti-aliasing. If both anti-aliasing, and color blending could be put together in Painter's brush engine, it would surpass every other digital painting program. This is something that matters - quality matters to professionals.. I really wish the development team could see that artists are looking for the best quality in their work. Pixelated edges are terrible quality. Anti-aliasing would correct this. It really is such a simple solution that is missing from the program. It would truly complete an amazing tool for digital artists and illustrators. Below are also some examples of finished illustrations. I'm sharing this in hope that this idea could be considered... it's not a random wish for the program, but a core need for visual professionals. Quality is a need, not a wish, for people who need to meet a high standard for clients with their work! You don't want to give garbage to your clients! You want to give them the best work possible, at the fastest speed possible. This tool offers speed, and vibrant color effects because of the blending properties. What is missing, is high quality - in the brush strokes themselves. All that it's missing, is anti-aliasing. These images were all made with Corel Painter, for a client. The first 5 represent different stories from the Bible. The last image is a wildlife portrait in progress. An apology for some of the scary scenes.. they were part of the commission requirements. In this reduced size version, the aliasing problem is not visible, but in the actual size (100% view) the jagged aliasing problem is an absolute eyesore. Really hope this problem with the "grainy hard cover" brushes can be eliminated. At this stage, every other painting program (except Microsoft Paint) has anti-aliasing. Painter should catch up, and be a leader in quality. Anti-aliasing is part of that high quality that is missing. Thank you for viewing this problem, and idea for the program. By the way, I'm very interested in the development of Corel Painter. If the team were ever looking for another digital painter interested in helping with the development of the program, I would be extremely interested in pitching in! anyway, this issue has been reported on here during painter 2018 lifecycle, and if painter 2019 is an indication, corel preferred to avoid addressing it in favor of whatever they were occupied with. get the demo, and if you like what you see, be prepared to invest around a month into building your new workflow there, and have another app ready for high-resolution work. if you use facebook, you can ask for collaboration opportunities over there because currently the general consensus is that corel doesn't respond on these boards to any soft of user feedback. you may want to skim through my painter 2019 thread to get an idea of what to expect from this effort tho, this comment in particular makes some points you may find interesting. Sadly, I think there is no solution to the edges outside of an internal change..
I’ve tried for a year and a half… but the program doesn’t allow for two factors together: subtle blending of “grainy hard cover” with clean edges.. You could have clean edges without blending, but not with it. I think this is because pronounced grain texture hides the fact that the edges have no anti-aliasing. But when the blending is stronger, there is less grain and it cannot hide the bad edges. The idea would be to have both together – clean edges, and “grainy hard cover” blending. But it’s only going to happen if the programmers code in the anti-aliasing. It's truly an incredible tool... extremely fast for painters/illustrators.. but aliasing.. really ruins it..
Wow, it doesn’t sound surprising if this was mentioned before..
Painter has such an array of promising tools ruined by pixelated edges! It’s such a simple solution too, that would add so much value to this program. Fixing loads of brushes. Thank you so much for the idea of trying Paintstorm, I bought it and used it for several weeks, but the blending achieved is a lot like Painter’s “grainy alpha blend” mode. In the sense that, the paint “washes over” what is underneath, instead of subtly blending with it. This makes the process a lot slower in comparison to Painter. 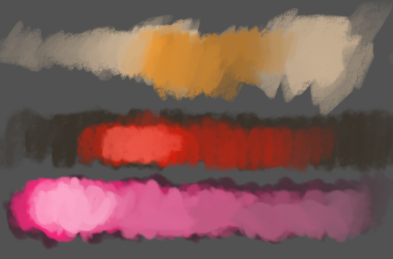 It feels like almost flying across the page in painter, whereas, it’s hard to just control the blending in Paintstorm.. slowing the workflow to a crawl. But it really is the closest one to Painter. Wow.. that comment by a collaborator… ouch. It’s sad that there seems to be a lack of motivation to improve this incredible program.. It really has so much potential.. To even be a competitor to Photoshop. But.. aliasing… sloppy zoom, etc… many core problems.. all that is missing from creating a professional tool. In my own case, I’ve had to resort to correcting each pixelated edge in “post-production”.. by hand.. :( several… thousand aliased edges.. that can take from 3-4 days per painting to fix. It’s a ridiculous and frankly, painful solution.. but it’s the only way to be able to keep using these tools – without sacrificing quality. It’s still faster than using Photoshop.. But... people shouldn’t have to go to such lengths to use this program.. It shouldn’t have to be that way. The Painter team could really make a change for a lot of people.. by.. taking this program seriously.. It could be a great program. It just needs the investment and attention to it. Thanks for the brushes and additional context. I think I understand the problem and the challenge...sounds like it will difficult to get the brush you need given the tech limits, but I'm happy to try in the very least it will be fun to see what we can get! Question--which version of Painter are you using? I have Painter 2019 but I also have a couple of the previous releases which I can use to build your new brush.